Archivists are commonly asked by researchers to produce everything available about a particular topic. While understandable from a researcher standpoint, fulfilling the request is a challenge. Unlike library holdings, archival material is rarely described to the item-level. This makes it difficult for archivists to do more than point researchers to where everything about a particular topic could be. The result is a persistent disconnect between researcher expectations and archival practice. It’s also an underlying cause of the increasingly prevalent, though by no means new, “lost in the archives” narrative in which archival material is deemed lost because it was not readily described in desired terms or, perhaps more accurately, widely recognized to exist. In actuality, most records that are deemed to be “found”, or “discovered,” have been available for use by way of archival finding aids and lost thanks only to the failure of anyone to read them. A recent example is media coverage regarding the “discovery” of an unproduced Edith Wharton play that, as pointed out by Eric Colleary, Curator of Theatre & Performing Arts at the Ransom Center where the work was housed, had been listed in print finding aids since the 1980s and in electronic finding aids since 2006. 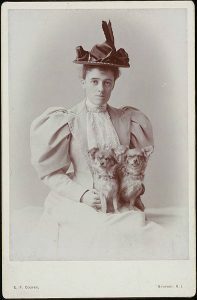 Photograph of writer Edith Wharton, taken by E. F. Cooper, at Newport, Rhode Island. Cabinet photograph. Courtesy of the Beinecke Rare Book & Manuscript Library, Yale University. Public Domain. While Molinaro’s framing of the Canadian government’s legacy of undervaluing and failing to prioritize recordkeeping as a secret archives is one that merits further consideration, it will serve here as an entry point for examining what researchers expect and what archivists can provide. Specifically, why it isn’t possible to ever obtain everything about X held in an archives or, more importantly, to bypass the sometimes daunting and unglamourous work of archival research. To fully unpack why seeing everything about X in an archives is so challenging, it helps to consider the distinction between library and archival description. When you find something of interest in a library catalogue and click on the corresponding title, a catalogue record is displayed. Contained within that record is pertinent information about the book such as the author, date of publication and related subjects that speak to the aboutness – topics or themes – of the book. Because catalogue records reflect a mass-produced object, they can be reused and repurposed by any number of libraries because the author and aboutness of a book doesn’t change. Once Kazuo Ishiguro’s Remains of the Day has been catalogued, edits or descriptive improvements that take place at one library can be put to use by others. Archival description is decidedly less utilitarian. As a repository for corporate or personal records of enduring value, an archives predominantly holds material that differs from library holdings by being one of a kind. Copies, electronic or otherwise, may exist, but a fundamental aspect of archival practice is preserving original records in a manner that documents the purpose, intent and use of the record as a way of upholding its authenticity and evidential value. While archivists may collaborate on high-level biographical or organizational histories, particularly when related or complementary holdings are held by multiple institutions, descriptive work for the records themselves can’t be shared because only one archives holds those records. Being unable to transfer or reuse archival descriptive records is further complicated by the purpose of archival description. It differs from library descriptive practice by prioritizing not the aboutness of a standalone record, but the original use, order and purpose of a group of records. In the Canadian context these records are referred to as a fonds. Instead of describing each record, archival description provides a high-level overview of the records within a fonds, focusing on information about the person or entity that created the records and the manner in which those records were used. While approaches to archival description may vary, the end-goal is always the same: provide entry points by which researchers can read, assess and make sense of the records at hand. Within this practice, and in part due to record volume, item-level descriptions are rare. In their place are file-level descriptions or lists, accompanied by dates of creation, formats and general notes, which serve as the primary means of accessing the records. The work of drawing intellectual conclusions, listening for conspicuous absences and reading between the lines is left to those who consult the records during the research process. Second, archival description is prone, like most anything, to subjectivity. Whether information is deemed worthy of mention, and to what extent, is ultimately influenced by the cultural or social lens of the archivist. And, as Jarrett Drake has outlined, there are countless examples that have served to establish “memorials and monuments to wealthy, white, cisgendered and heterosexual men.” This has, in turn, helped to create a legacy of archival descriptions that have perpetuated the systematic marginalization and underrepresentation of Black, Indigenous and people of colour. Finally, due to the labour intensive nature of descriptive work, fonds are often described only once, leaving the language and technical considerations of the era in which they were created to resonate indefinitely. This means antiquated terminology, the assumption of on-site research and, rather rudely, zero consideration for web-based keyword searching. Illuminated CN Tower in Toronto at night. Public Domain image. Given the limitations and stylistic quirks of archival description, pulling everything for manual review in order to find everything about X is one way forward, though one that can only be achieved with a small number of records. 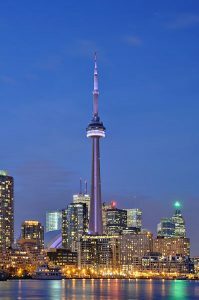 When a CN Tower is involved, it can be, frankly, impossible. One must also examine who would be doing the work of manually reviewing the records, keeping in mind that while archives staff can and do assist you with your research, they aren’t research assistants. The role of an archivist isn’t to perform close readings of records in order to identify hints of curious or compelling narratives. That’s the job of a researcher. When you ask an archivist to pull together every file pertaining to a particular topic, you are effectively requesting a keyword search. Anything more amounts to asking that they do original research on your behalf. Whether broad searches of this nature are conducted manually or electronically – in Molinaro’s case the age of the records means they would all need to be reviewed manually – a failure to find desired search terms would result in a negative response about the availability of information on a particular topic. Therefore one can and should view requests from archivists to broaden or narrow a request not as attempts to suppress records, but as a limitation of working with available descriptive information and a desire to provide the best possible options for more detailed review. To conclude, I’ll offer some counterpoints to the “lost in the archives” narrative, which, in addition to erasing the labour of archivists, perpetuates the Googlization of the research process and masks the extensive intellectual labour and time investment of original research. In May of this year it was announced that the mother of Leonardo da Vinci had been identified by Professor Martin Kemp as Caterina di Meo Lippi. He concluded her identity after thoroughly reviewing 15th-century property tax records. Another centuries-old question was answered in 2015 by Professor Frans Grijzenhout, who identified the location of a 17th-century Delft house depicted by Johannes Vermeer after reviewing a ledger documenting the dredging of canals in Delft. The research work involved in both these findings is perhaps best captured by historian Marie Hicks who recently outlined, via Twitter thread, the innumerable number of hours she spent reviewing seemingly inconsequential archival records only to hit on proof that women didn’t leave computing, but were instead pushed out. In each of these examples the question “give me everything on X” would have failed to yield files clearly labelled with the newly identified evidence, yet the answers were there for the finding, and an archivist most definitely ensured there were clues available to lead the way. While it may be exciting to imagine a secret archives where teams of employees are hoarding “the good stuff” and working to keep records from the public, the reality is significantly less diabolical. Danielle Robichaud is Digital Archivist in Special Collections & Archives at the University of Waterloo. Her work focuses on improving the discoverability of archival holdings and increasing access to digitized primary resources in a manner that diversifies the narratives surfaced online through outreach and content development. Some of the framing of this piece I take exception with primarily because it makes some wrong assumptions about what transpired in my research and also seems to insinuate that I was somehow looking for a easy route to archival research and “to bypass the sometimes daunting and unglamourous work of archival research.” As someone who is well published in the field of history, with a PhD and book, I take exception to someone presuming to know how I conducted research or what my aims were. Frankly, I think it takes away from the overall arguments presented which really didn’t need some of these comments. The material I was trying to get at is part of the security exempted material which some historians in the past have had access to and have produced classified histories with them. A significant amount is organized. A significant amount is not but the researcher has no way of knowing what is and is not if the government doesn’t engage in an open dialogue about holdings. If someone would like to know all the steps in terms of how I went about my research, they are welcome to approach me and ask where I can reveal more in detail rather than make assumptions from what can be pieced together from the internet. Hi, Dennis. Your experience is an important instructional case and I worked hard to treat it as such. I’m sorry to hear that it was read exclusively as a comment on your personal understanding of the research process rather than an intentionally considered contribution to the work being done in both of our fields. Researchers from most backgrounds fail to receive an overview of archival practice as it pertains to the research process and my aim was to move toward addressing that gap in knowledge. I have and continue to wish you the best with your research and appreciate that your article prompted some much-needed dialogue. Thank you for the feedback and the continued exchange – it’s been rather illuminating! It wasn’t exclusively read that way, only the portions that for some bizarre personal reason I will never understand, you inserted specifically for that purpose. I’ve nothing further to add publicly. I would also encourage people to read the letter submitted by the Association of Canadian Archivists and the Association des archivistes du Québec following the CBC’s investigation into Secret Archives.